Below is our review of the Asus S200E, a 11.6" laptop, featuring 4GB RAM, 500GB hard drive and Windows 8. 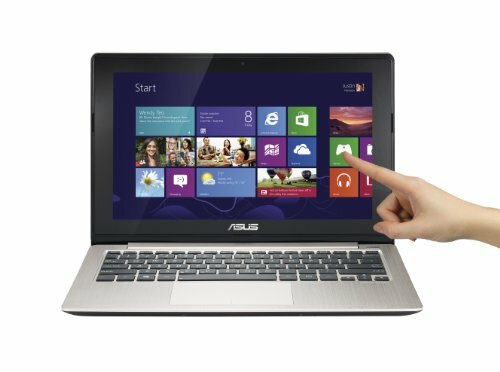 The S200E from Asus is a light, small and thus highly portable notebook, aimed at the mid level of the laptop market. Measuring just 30.3cm by 20cm by 2.1cm, it offers considerable computing power inside it's small shell, with an impressive Intel Core i3 3217U processor operating at 1.8GHz, 4GB of RAM and a large 500GB hard drive, all running on the latest Windows 8 platform. The Asus S200E is part of their Vivibook range, and weighs just 1.38kg - far lighter than many of it's competitors. The first thing you notice about this laptop is just how thin it is - just 2.1cm at it's deepest - and at only 30.3cm long it will easily fit into your backpack. The small size, together with the light weight, make this laptop ideal for those who have to commute or plan on travelling - it wouldn't be a problem carrying this laptop as hand luggage. With an overall screen size of just 11.6", you may not wish to use this laptop as your main computer - however whilst out and about, it will complement your existing setup, enabling you to work and indeed play whilst away from the office. For it's size, the screen offered an excellent picture, with crisp visuals and bright colours. The notebook does have an HDMI output if required, so watching media on larger screens such as TVs or another monitor will not be a problem. The default resolution is 1366 pixels by 768 pixels. The processor supplied is the popular Intel Core i3 3217U 1.8 GHz, which along with the 4GB of RAM keeps the system running fast. Operating duties are handled by Windows 8. Storage wise you are catered for by a 500GB hard drive operating at 5400rpm. Other connectivity includes: 2 x USB 2.0, 1 x USB 3.0, HDMI as mentioned, ethernet, card reader, VGA, and a joint headphone / microphone jack. There isn't a DVD drive with this laptop, which helps keep the weight down. The finish is a beautiful brushed aluminium, which gives this laptop a degree of style, as well as helping to provide stiffness and strength. So overall what did we make of the Asus S200E, and who is it aimed at? Perhaps too small to be used as your main computer, the S200E is ideal for traveling with - light, reliable, small but with plenty of power and decent battery life. Pros: Small, light and sleek - offers good performance in a tiny package. Cons: The screen may be a touch on the small size to consider using this notebook as your main computer. Great for travelling, and ideal for those who are away from home. Not an ideal main computer due to screen size limitations, a great laptop for everything else.